A few months back we told you about our favorite treats. One of our favorites is Mini Naturals from Zuke’s Performance Pet Nutrition. Mini Naturals are delicious (according to Chester and Gretel. I haven’t tried them myself), pea-size treats that are perfect for small dogs, training or as low-calorie treats between meals. We were so excited to learn that a Wild Rabbit flavor was added to the flavor lineup (the other flavors are chicken, peanut butter and Salmon). We couldn’t wait to try them. As with all of Zuke’s treats, they are free or wheat, corn and soy and artificial colors and flavors. But guess what these treats DO contain? That’s right – Wild New Zealand Rabbit! We feed Chester and Gretel Zuke’s treats all of the time. In fact, they are one of our absolute must haves when hiking. We love them! We love them for many reasons besides just being drool-inducing for Chester and Gretel and all natural. We also love that their offices are powered with 100% green energy and they use recycled materials whenever possible. We love that they pay their employees to ride, walk, run or scooter to work with their dogs. We love that their tagline is “Fuel the Love” (how great it that?). We also love that they donate a portion of every sale to the Dog and Cat Cancer Fund. 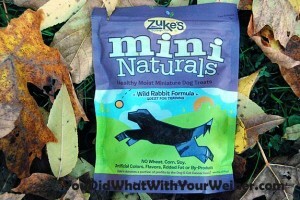 We love them so much, and we got the attention of Zuke’s with our enthusiasic review, that they sent us a package of Wild Rabbit Mini Naturals to try. Chester and Gretel loved them just as much as the other flavors. For me, I prefer them over the salmon because the don’t stink as much (although they still strangely smell a little like fish to me. Must be the fish omega oils in them). Cool idea YDWWYW! Thanks for all the neat pics and stories from your adventures! Thank you for the review on the Zuke’s mini naturals treats!! I know Clancy will be thrilled to try them if we win in the giveaway! 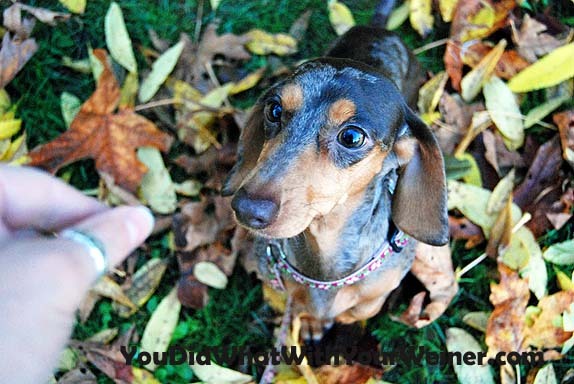 Thank you for all you do to keep us doxie lovers informed. We buy Zuke’s salmon treats all of the time. Will have to keep and eye out for the rabbit. If you want to enter all you have to do is post to our Facebook page and then post the link to it here. Love Zuke’s! Especially their mini-chews … perfect size for bite-size dogs that want more than a bite of a tasty treat! Here’s my link, and my puppies are already licking their chops! We luv Zukes : ) It’s our favorite training treat – nice and soft, and it doesn’t crumble in your pockets. Plus, Toki says it’s deeeelicious. Forgot to add the link to our photo! I sure would like to give those treats a try, I’ve never seen them before – yay!! Yeah, that is the link 🙂 I can’t believe you have never heard of these! Zuke’s is awesome. My little Kyle LOVES Zukes! He would be so excited! This giveaway looks awesome! We are always excited about trying new treats (Leeloo will do ANYTHING for treats!). Just entered. Hope you can see the video. It’s pretty funny. Olivia would love to try some rabbit treats, hopefully her mother submitted this link correctly. Thanks for having a cool giveaway! Plus, Toki says it’s deeeelicious. We luv Zukes : ) It’s our favorite training treat – nice and soft, and it doesn’t crumble in your pockets. Here’s my link, and my puppies are already licking their chops! Ohhhhh, I missed the giveaway! I’ll have to keep a look out for future ones. My dogs love the roasted chicken flavor of Zuke’s. They’re yet to try the rabbit. It’s next on my order list. Thanks for stopping by. We will probably be giving away another package of Zuke’s treats before the end of the year.